Low prices. OrangeSmile.com offers car hire service in Saudi Arabia on the lowest-rate-guarantee basis, since we work with car suppliers directly. For your search criteria in Saudi Arabia, we always select and show the best rental offers. The car reservation process consists of 3 simple steps: (1) search for available cars for your dates in Saudi Arabia; (2) select your car type; and (3) fill in the booking forms. Once the reservation is completed, you will receive a confirmation voucher to your email address. During the booking process, please check your rental conditions. To pick up your car at the rental point in Saudi Arabia, you need to provide our confirmation voucher, your driving license and a valid credit card. The final payment is normally carried out at the pick-up point. Our car hire points in Saudi Arabia accept VISA, MasterCard, etc - please check your rental conditions. At the pick-up point, please read the handling manual and check the car for present defects. OrangeSmile.com wishes you a pleasant journey to Saudi Arabia! The car hire reservation system OrangeSmile.com allows renting a vehicle in Saudi Arabia within 10 minutes. Our largest database of car suppliers enables us to provide you a rental car in Saudi Arabia at the cheapest rate ever possible. At rental locations in Saudi Arabia we offer the following car sizes: mini, compact, economy, standard, premium and luxury. The following car types are available in Saudi Arabia: Sedan, Hatchback, Jeep, Cabriolet, Coupe, Minivan and Minibus. Saudi Arabia has always been a large centre of pilgrimage. Despite the fact that this country doesn't do much to promote its tourism industry, every year the country is visited by thousands of travelers, who want to see beautiful ancient cities and internationally famous sanctuaries. Several important tourist objects are located in the capital of country, the city of Riyadh. Here travellers are recommended to visit the Masmak Fortress that was built in the middle of the 19th century. The fortress was a witness of many important historic events, and since its building it changed owners several times. Initially, the fortress was used as a warehouse, and later a museum was opened in it. Diriyah is a very interesting and old city located not far away from the capital. Travelers are recommended visit this place as they will find many fascinating attractions there. Beautiful palaces, mosques and a thick protective wall remind of the past glory of this place. Diriyah was founded in 1446 and for more than three centuries the city was the most prosperous settlement of the Middle East. In the beginning of the 19th century, the city was completely destroyed by the Turks. After that, Diriyah was carefully restored during many years, and nowadays it's a very interesting research center for scientists and archaeologists. There are also modern buildings in the capital, and they deserve close attention. 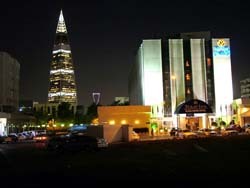 Kingdom Centre is considered one of the most famous skyscrapers in Riyadh. The height of the building is 311 metres, and its 47 floors have become home for numerous offices, conference halls, sports clubs, restaurants and a five-star hotel. However, Medina has remained the most famous destination for pilgrims for several hundred years. There are many beautiful mosques in the city, but the Quba Mosque remains one of the most famous of them all. This is one of the oldest mosques in the world, and first stones of the mosque were positioned by the Prophet Muhammad. The building attracts not only pilgrims, but also architects as this mosque is a great example of first Islamic buildings. Al-Masjid an-Nabawī is the second most important religious shrine for Muslims. This mosque is also known as the Mosque of the Prophet. There are many legends and tales connected with the mosque. It has changed its original look greatly as every epoch added new features to its design and architecture. The Great Mosque, Masjid al-Haram, remains of the most famous destination in Mecca. This mosque hosts a priceless religious artifact of all Muslims - the Black Stone. According to a legend, this stone was gifted by God to Adam and Eve as a symbol of forgiveness. The mosque amazes visitors with its size and beautiful design. If you do not want to make a large advance payment at the moment of reservation, examine the 'Pay Now:' line for each vehicle shown in the search results. This line is allocated under the picture of each car. As a rule, a border-crossing permission fee is not included in the rental rate. It is paid additionally in the office in Saudi Arabia. Normally, the fee is approximately 2-10 euro/dollars a day.